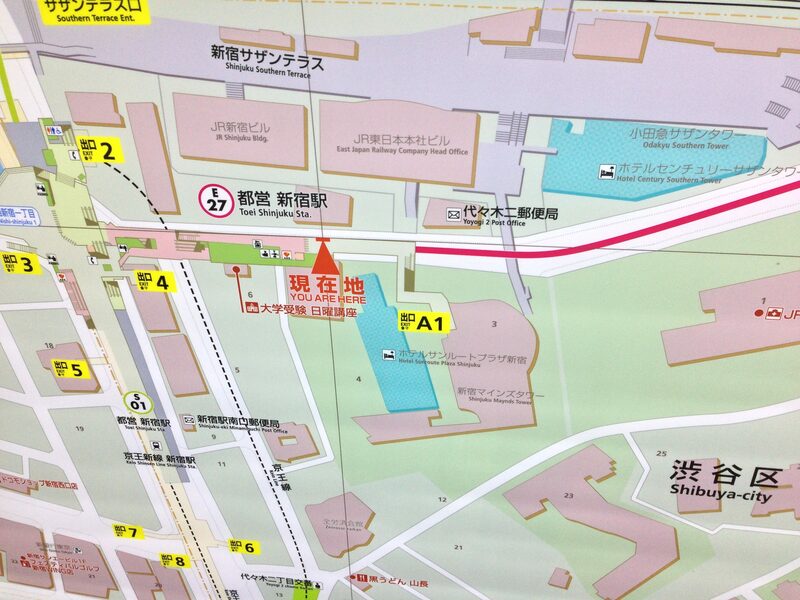 When we last saw our intrepid heroes, they had just finished looking at various maps in Yoyogi, near Shinjuku. Today, we follow them as they explore small parts of that neighbourhood. This was an amazing little textbook store, with all kinds of stationary. 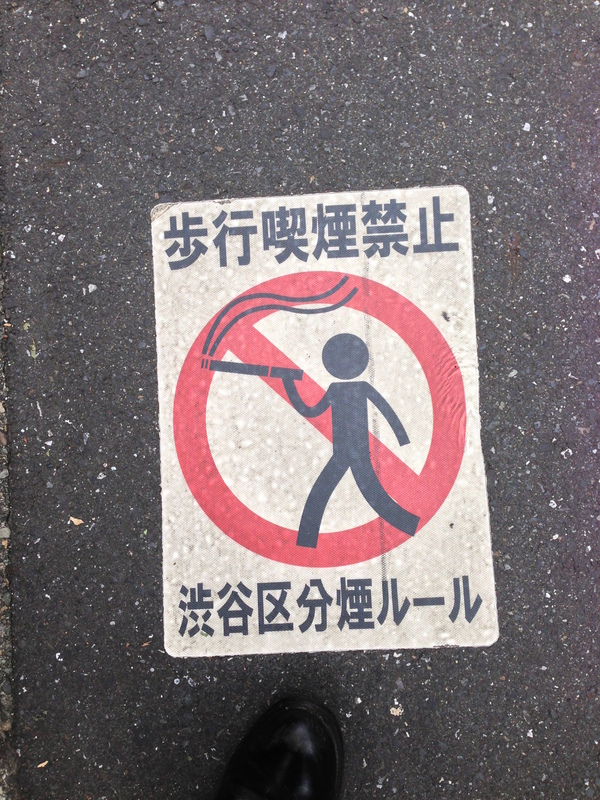 This picture is somewhat unconvincing about the uncoolness of smoking. 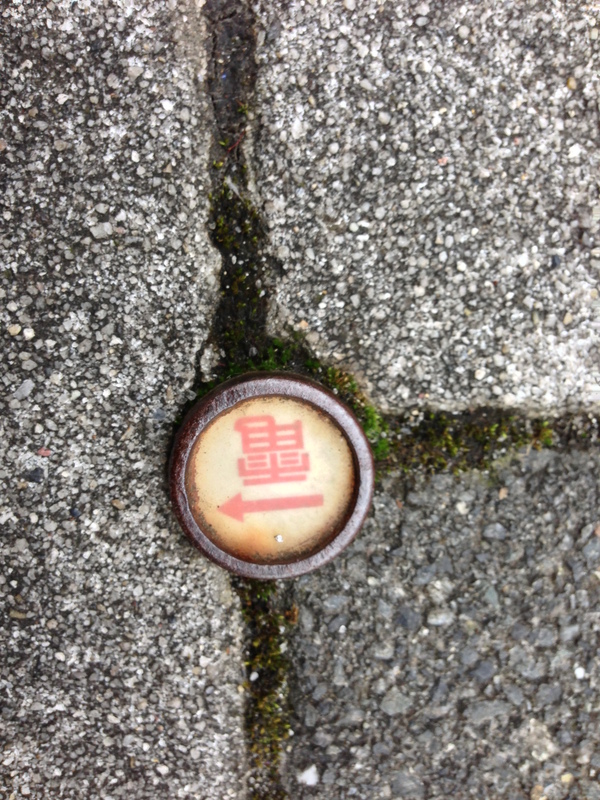 We saw this little sign on the ground. Near as we can tell, it says ‘electricity’. Another strange sign embedded in the ground. “Weak Electricity” and an arrow. I liked the contrasting shapes of these buildings in the distance. Note the warning sign on the arm. 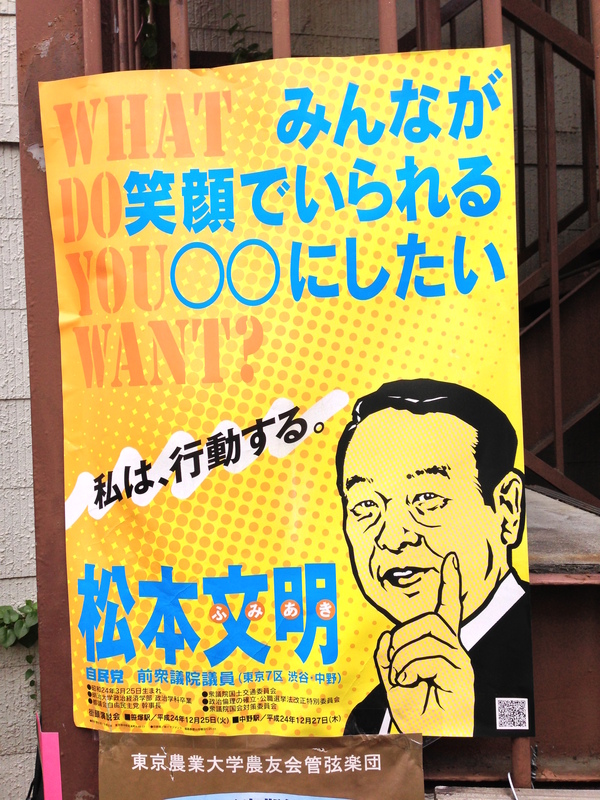 The one on the top seems to be a person called ‘NaGaTsuMa‘, with “The Democratic Party of Japan“, which apparently has had an interesting recent history. Oddly, it mentions in the top right corner his birth year (1960) and month. Interestingly, his name is in Hiragana, not the more formal Kanji, I’m assuming so it’s easier to read. At the time of the election, he would have been 52, I’m not sure if that would make him young or old for running for office (as to why he would include his birth month on the poster). Also note the prominent but understated wedding ring. The other two signs seem relatively normal. Tamayo Marakawa seems reasonably famous. The green sign has ‘DaKaRa oneself people/subjects party/faction“, or perhaps “So what if one’s self makes their own party”, perhaps referring to the party that had split off from the Liberal Democratic Party, and was currently in power. There seemed to be an election going on. This is a selection of campaign posters. The person seems to by Fumiaki Matsumoto. 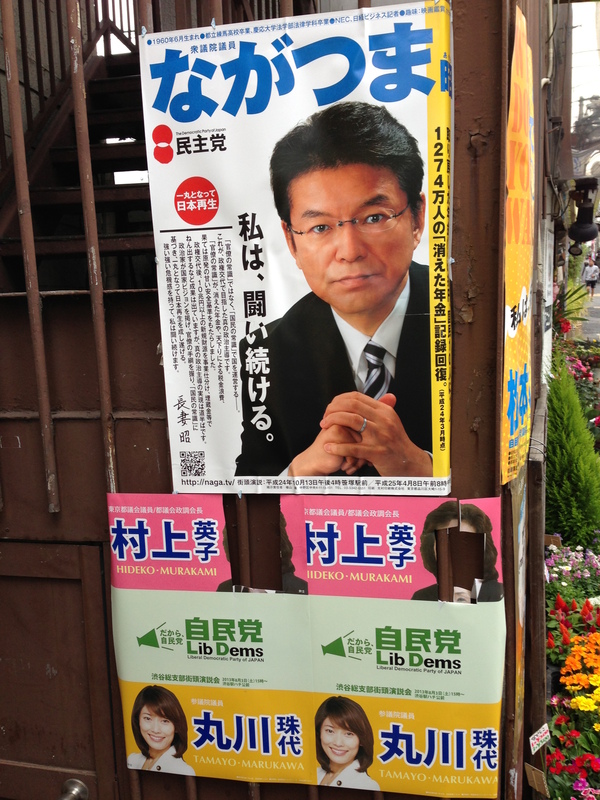 Note that the person making the poster helpfully spelled out his first name ‘FuMiAKi’, probably to help people vote. 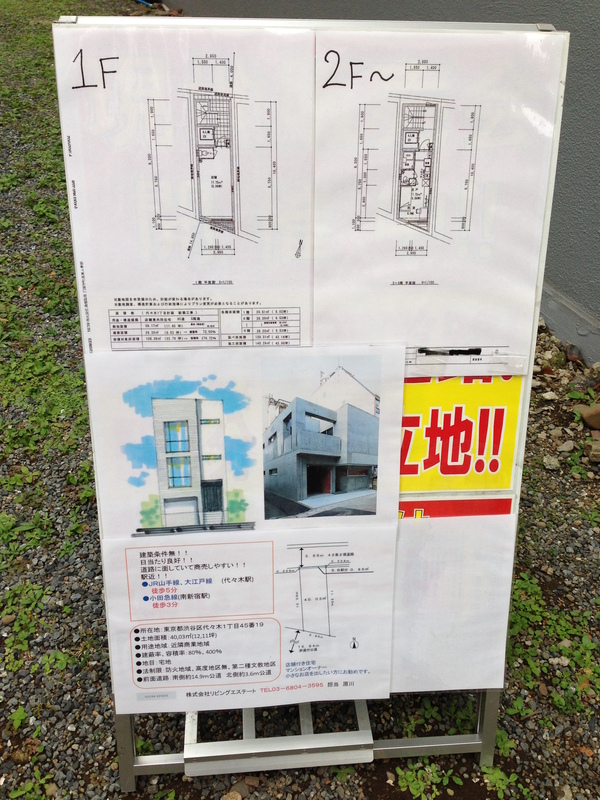 An advertisement for a place to live. Can’t tell if it’s a rental or purchase. Stay tuned for next time, when our intrepid heroes visit the mythical Department Store ‘Tokyu Hands’! In some ways, these repeated similar words remind me of the words around the ‘Utwig Planetary Engineering Tool’, or Ab’s commentary about the ancient weapon. Also similar to many sci-fi novels’ ‘translations’ of alien languages, putting multiple words to represent one alien word, to show that their concepts are grouped differently than they are in English. Google seems to agree, for what it’s worth. It’s written in dozens of different languages, but they all translate to ‘Boom’. 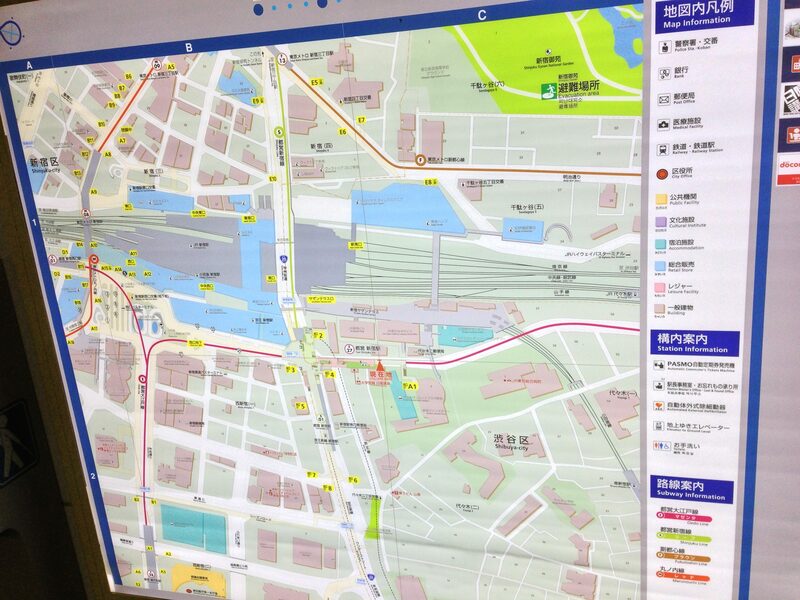 When we last saw our intrepid travelers, they had just finished decoding part of a map inside Shinjuku station. They decided it was time to go out and explore the neighbourhood. The first neighbourhood map we documented. 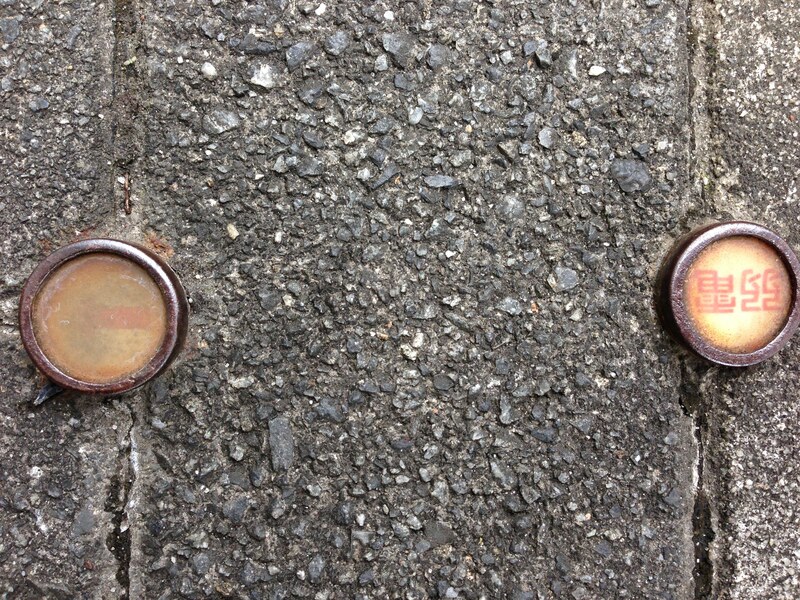 The green label on the top looks like it reads “ShiBuYa (ward in Tokyo) YoYoGi (neighbourhood in Shibuya ward) T-38-3 RD7″. The large green label on the left reads: “MaChi Wo Mi ShiKu! !” or “Town/Neighbourhood (of) Beauty District”. There are a number of things I can’t decipher, such as: “FuaMiRi- Ma-To”, and “(TeNTeN)”, which might be a cool bar with a difficult-to-search name, or perhaps an eyebrow salon. 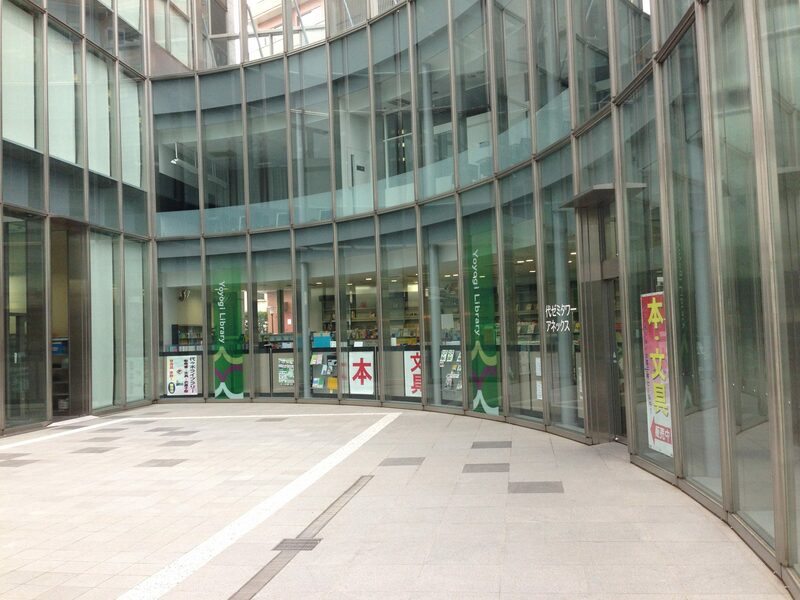 “TeRuRuMoBaIRu”, possibly a mobile phone store, but also turned up this in a google search. 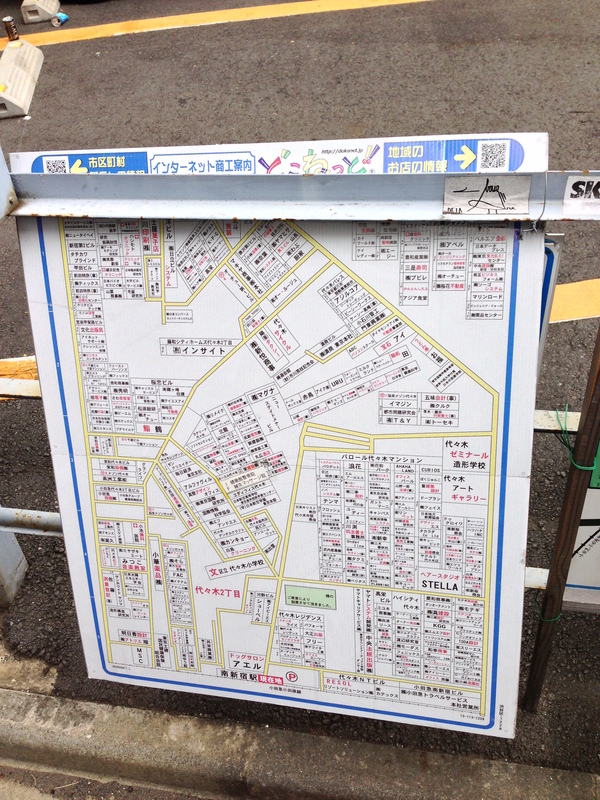 The previous map and the next map were beside one another on the street, suggesting that they referred to the same or similar neighbourhoods. At the time, we had figured that these maps were some sort of neighbourhood directory, but I had thought that the one above was commercial, and the one below was residential. At the top, in blue on white, it seems to say “INTa-NeTo”, beside a ‘DoKoNeTo’ ad, suggesting it’s an internet company ad. Beside it is a pointer to a QR code, which I will ignore, because QR codes are silly. And many others I can’t make out. How many can you find/translate? 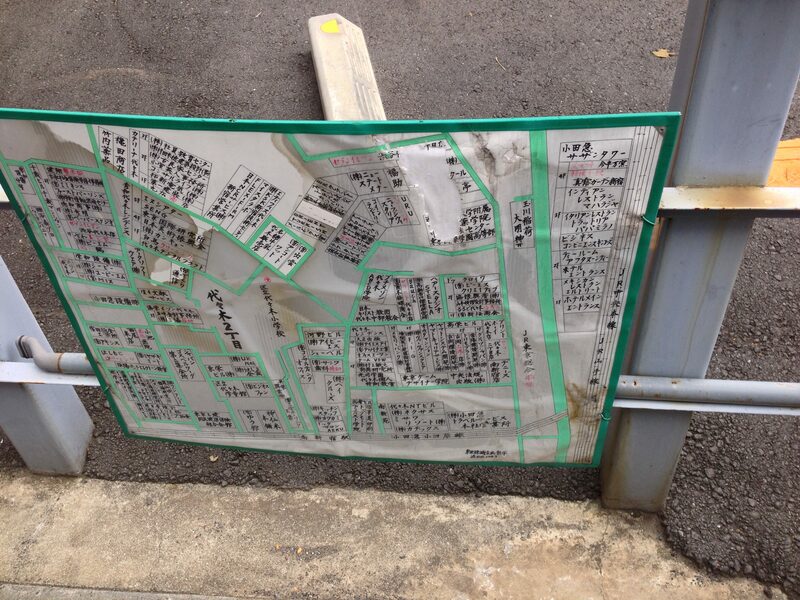 This neighbourhood map seemed a little worse for wear. 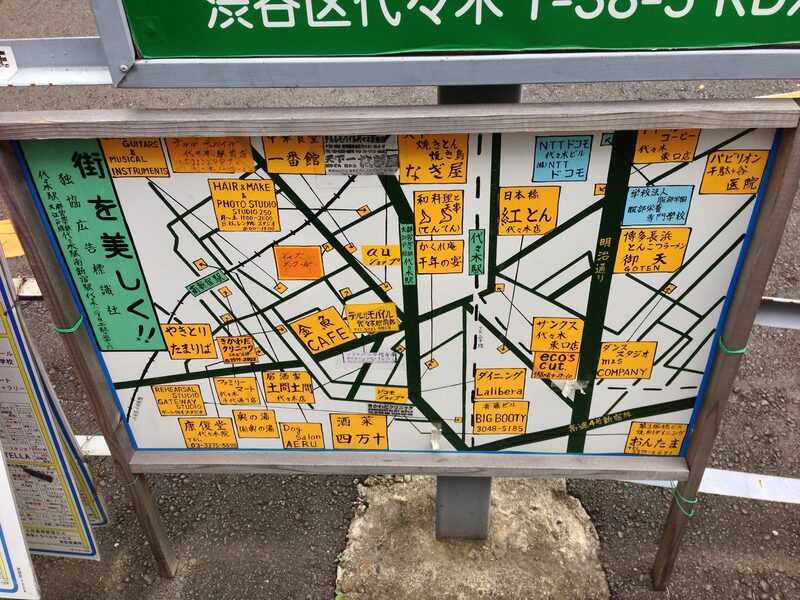 I can’t make out too many words in this one, perhaps a ‘KuRi-Su’, there’s a JR station on the right side of the map, ‘SaSaNiTaWa-‘, and many others I can decipher even less about. What can you figure out? I feel like this has helped me with a lot of Katakana practice (and Yoyogi-recognition practice), but I still have a long way to go. It’s also interesting to see how many different neighbourhoods that we had heard of were so accessible to each other, often just by walking at random. Stay tuned for next time, when our intrepid travelers, now that they’re oriented themselves, start actually experiencing the city! Some of their explorations from that first day, related to the design of the city and various objects, were captured earlier in ‘Thoughts on Design in Japan‘. As part of our preparation for going back to Japan (and now that I’ve finally organized all of my pictures), I’ll be revisiting our first trip there in 2012. Part of the goal is to help me re-learn Japanese, part is the fun memory lane trip. YOU ARE HERE: A closeup of the area around Shinjuku Station, our favourite Tokyo train station. ‘E 27’, the Shinjuku Station on the Toei Oedo line. ‘JR Shinjuku Bldg’, literal translation ‘JR Shinjuku BiRu’. Until now, I had no idea that ‘BiRu’ was the transliteration of ‘Building’. Moving on to ‘Shinjuku Southern Terrace’ (literal translation ‘Shinjuku SeZeN TeRaSu', which you get to through the ‘Southern Terrace Entrance’ (‘SeZeN TeRaSu Opening‘). Note that the last character is not the Katakana ‘Ro’, it is instead the Kanji ‘KuChi‘, for opening. Moving clockwise, we see the ‘East Japan Railway Company Head Office’, or ‘JR East Sun origin main company BiRu’. Continuing clockwise, we see our first name entirely in Katakana, the ‘Hotel Century Southern Tower’, or ‘HoTeRu SeNChiyuRi- SeZen TaWa’. We then see an ‘Exit’ sign, or ‘Exit Opening’. 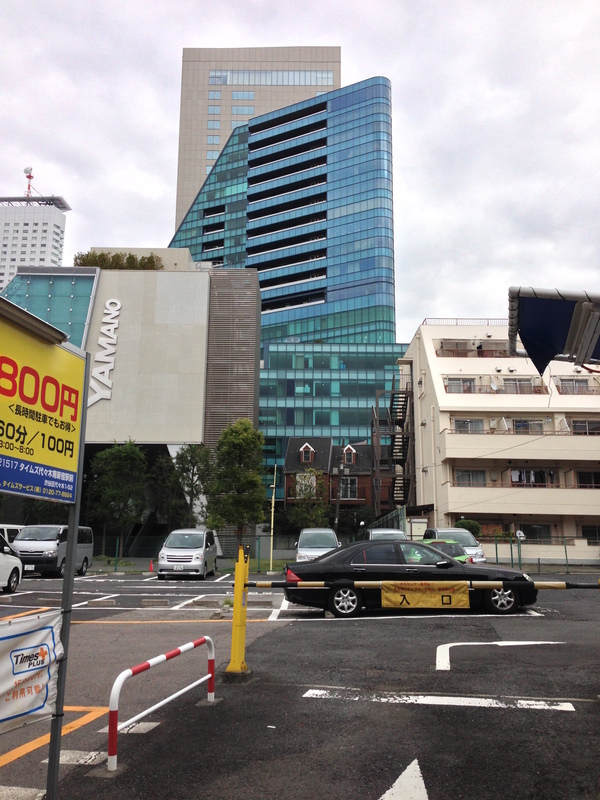 This is right next to the ‘Shinjuku Maynds Tower’ ‘Shinjuku MaINZu TaWa-‘, which seems to be a 34-story office building. The last one that I want to translate here is in the lower left-hand corner, in red: ‘Shinjuku SeNE- BiRu 1F’ ‘FueSuTei BaRu GoRuFu’ ‘Shinjuku WING Store‘. This seems to say (to me) that there’s something on the first floor of this building, perhaps a bar and grill and store? Katakana is often difficult to de-transliterate, as you often have no idea which language the words are loaned from. Perhaps someone in the comments can answer! 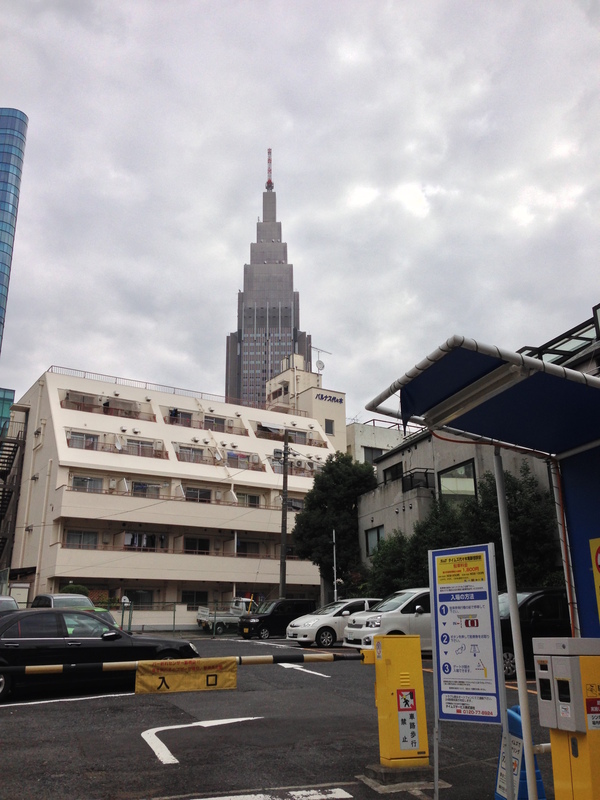 The Area around Shinjuku Station, our favourite Tokyo train station. …and then continue on their journey. Stay tuned! Many thanks to the KanjuVG Project and Ben Bullock: http://kanji.sljfaq.org/ They were able to detect my poor drawings of kanji symbols on the first attempt, and their first suggestion was correct three out of three times (for the third symbol, I had to tell the program to ignore my stroke order)! If you’re going to be working a lot with Kanji, it’s worth learning the rules for stroke order. Interestingly, ‘Shinjuku’ means ‘New Juku’, or ‘New Lodge‘. Knowing this meaning of ‘Shin’ was to be helpful later. Not to be confused with ‘Bi-Ru-‘, or ‘Beer’. In these transliterations, I’m using a Katakana chart, and capitalizing the first letter of each syllable (including the syllable ‘N’, sometimes pronounced ‘M’ by our teacher). Interestingly, this is one of the few words I remembered from my 8 months of Mandarin back in the day, although only the meaning, not how to pronounce it.